I’ve said that I believe that Plateau des Glières is one of the best climbs that has yet to appear in the Tour de France. 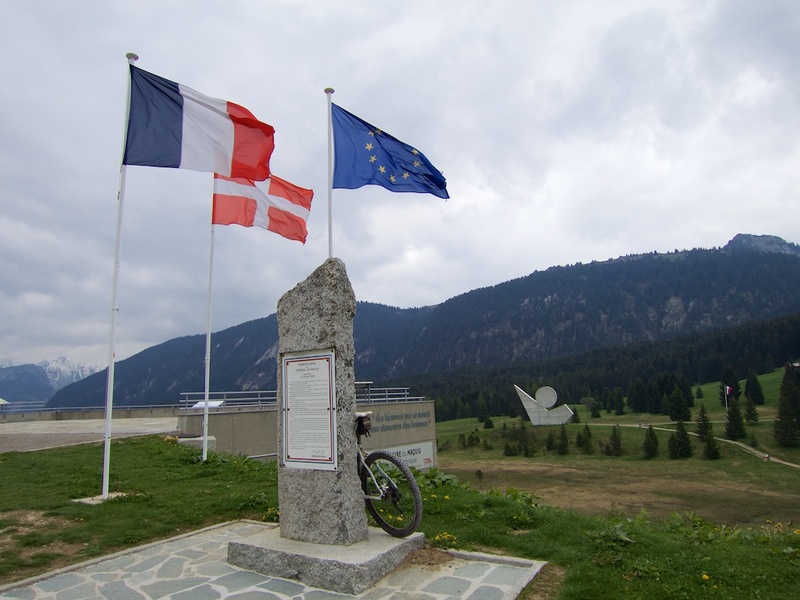 Two challenging paved sides leading to a beautiful and historic plateau that includes the Monument National de la Résistance. It’s also perhaps my favourite place to Cross Country Ski in winter. For details of the two paved ways up to Plateau des Glières see here: West side and East side. Starting from Thorens-Glières, the route begins with a 6 km climb to Col des Fleuries on a quiet, paved road with views of the huges Glières massif to the right. From the Col, I turned onto a small farm road heading higher. At 1100 metres the paved road ends and the route becomes a fabulous, gravel forestry road. Note, occasionally this road becomes very, very steep. Too steep for me to pedal, especially on the wet gravel surface. The road actually bypasses Col de l’Enclave (1495 metres), but I took a short, steep detour on a hiking trail, carrying my bike. From Col de l’Enclave (great views on a nicer day) a road heads up, and soon rejoins the gravel road. 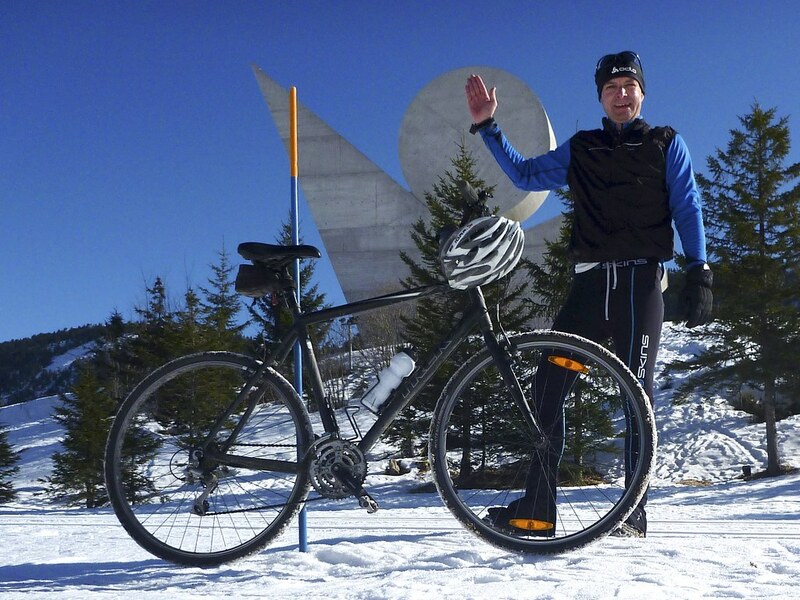 The high point of the road – 1710 metres – is actually between Enclave and Col de Landron. Descending from Col de Landron I entered a sort of hilly plateau north of Plateau des Glières, completely surrounded by rocky ridges. 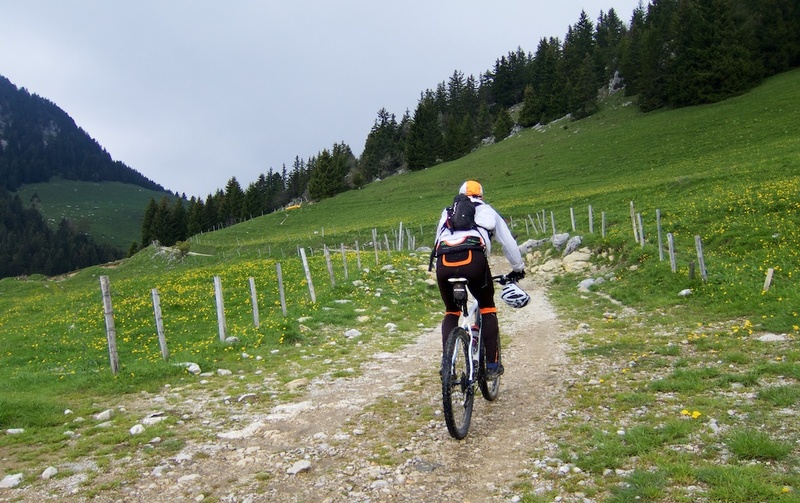 For a more straight-forward ride, from here, one can follow signs directly to Col des Glières. But I turned left on a rocky road heading deeper into the mountains. It’s a beautiful, and remote area. It was quite cold with remnants of the recent snow. They were difficult to photograph, but I came across a herd of wonderfully horned bouquetin. The road eventually peters out a little below Col de l’Ebat. 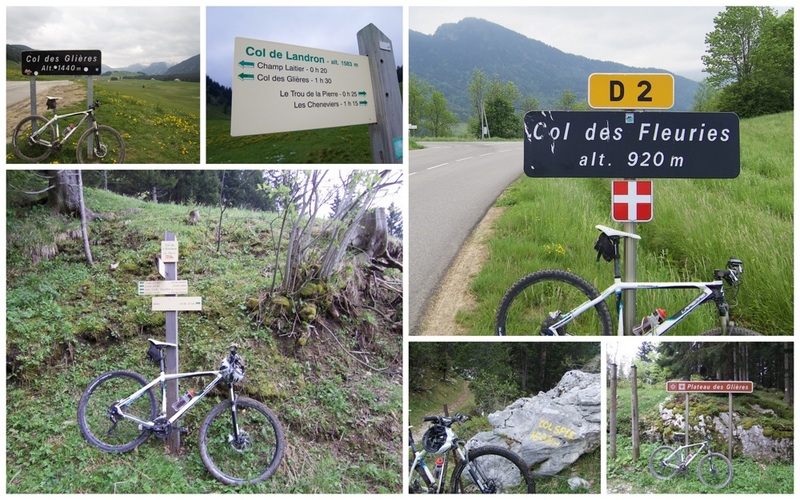 I followed some hiking trails passing Pas de la Truie and Col du Freu on my left. Eventually I wandered down to a little plateau with a couple of old farm buildings. 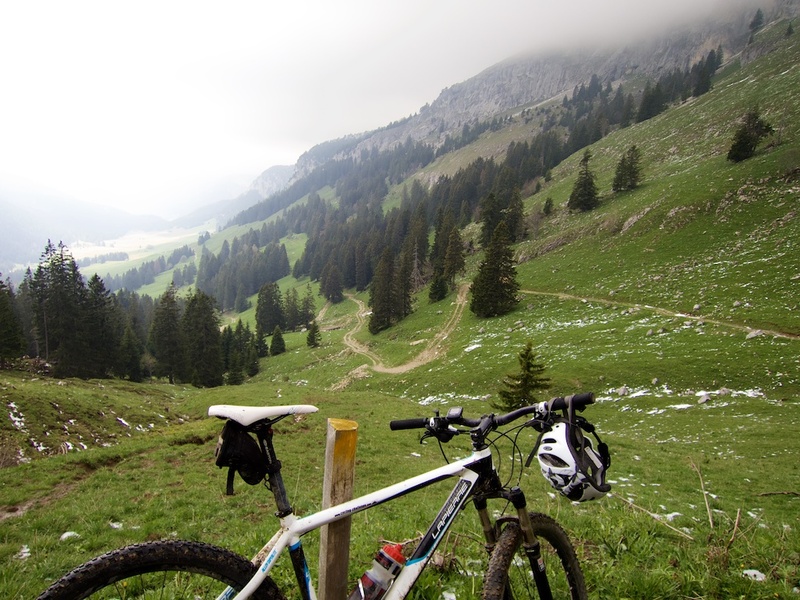 Here is the trail head for Col de Spée. It’s only a half kilometre hike up, but very steep and rocky …. not easy when carrying a mountain bike. I loved the painted Col sign. By climbing Col de Spée it allowed me to descend down to the far east side of Plateau des Glières. 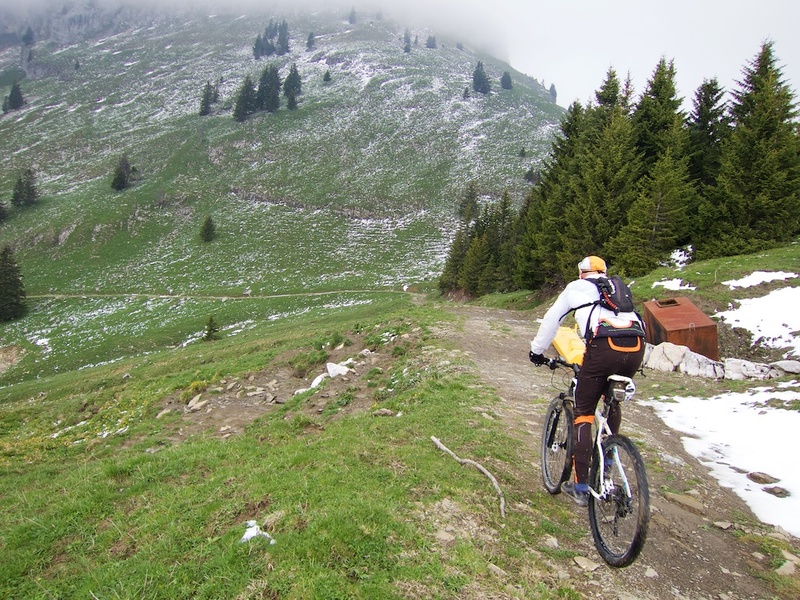 It’s a tricky descent for a while, but eventually reaches Chalet de Spée and a rocky but wide farm road that I followed all the way to Col des Glières. From Col des Glières I just followed the paved road down the west side back to the start point. A very fun, hairpin-filled descent. 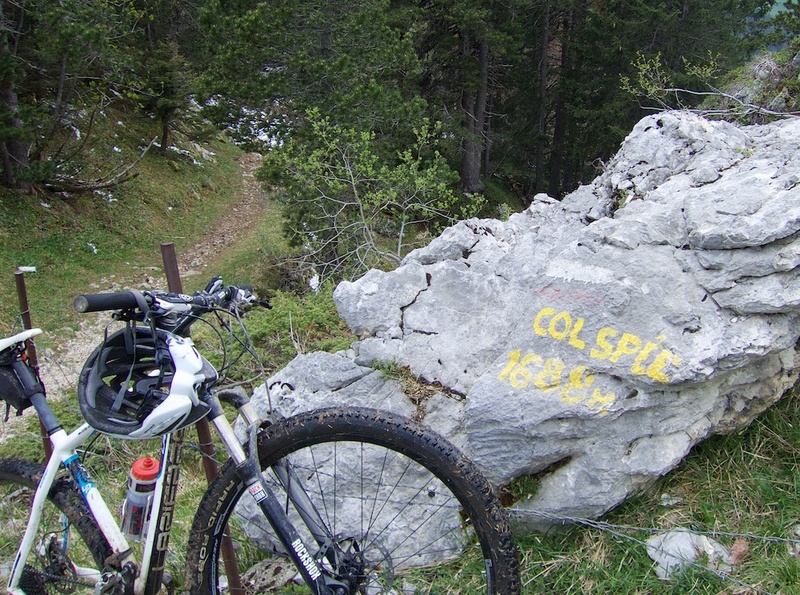 All-in-all, this very remote, challenging route includes 6 cols, and passes very close to three more. 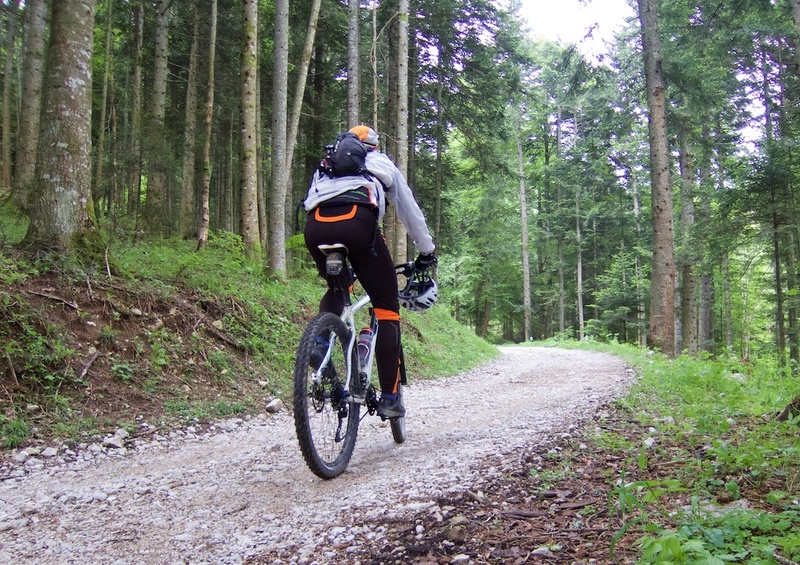 But again beware: even the strongest cyclist will need to carry the bike once or twice. 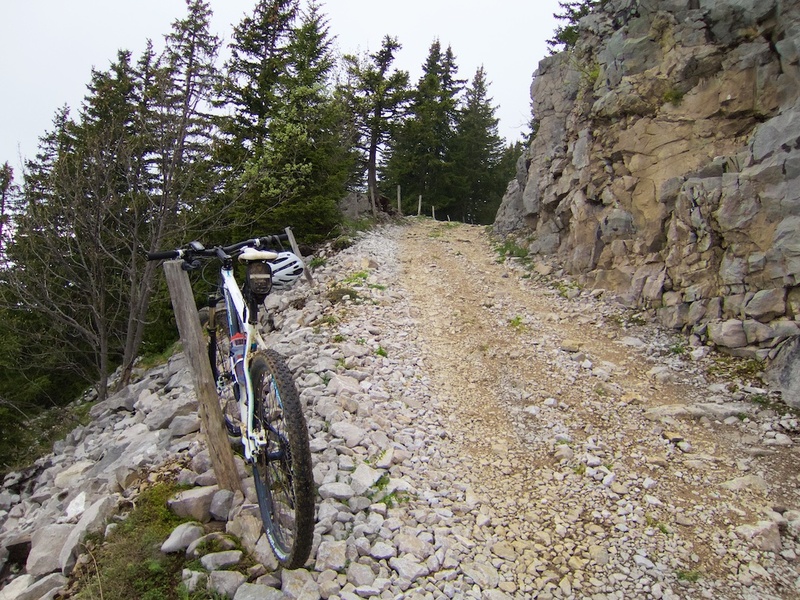 For another unpaved route that reaches Plateau des Glières, but from the south, see here. Awesome route Will. Nearly reached my breaking point with some of the pushing but the rewarding views and riding were well worth it!